Book your Gaylord area packages now! When you’re planning your golf trip to Gaylord, why not let someone else make the tee times for you and save money? The following Gaylord area lodging facilities are able to offer golf packages which include golf & lodging. Some offer meal planning as well. 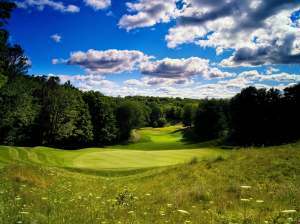 What could be better than world class golf centrally located in the heart of beautiful northern Michigan right off I-75? Book your 3 Night 3 Round golf package & fly TVC. Getting to northern Michigan is EASY! With many non-stop and one-stop flights arriving from every corner of the United States, travel by way of Traverse City's Cherry Capital Airport is CONVENIENT. Northern Michigan’s regional airport – Cherry Capital (TVC) is serviced by American, Delta and United. Visitors are just over 60 minutes from runway to the fairway in the Gaylord Golf Mecca! *Customized Golf Packages: *You Tell Me When, Where, How Long! 2 Nights Accommodations ~ 3 Rounds of Golf. *You Tell Me When, Where, How Long! Must designate location at time of reservation. It doesn’t get any better than Unlimited Golf from Arrival to Departure! That’s literally all the golf you can play. Please note that the above package can be customized to your exact specifications by adding rounds, nights, spa services, activities and more. If you're looking for a quick and easy golf getaway, you'll love the Traditional Stay & Play at Treetops. "This is our 5th time back here. We love the golf, the town of Gaylord. Large spacious rooms. Food is great!"